Words from the heart. Certain neighbors may not think much of it, but they’re the ones for whom it was intended. A great doormat that will help you to let people go away from your front door. If not still entirely effective in making people laugh when they see it. This funny doormat makes a statement about a person’s desire for privacy. Why “Welcome” your guests in the same way as everyone else? Show off your style before they’ve even entered your home. A perfect thing to add to your man cave. This funny doormat will greet your guests or friends in the funniest way. And we all know that man caves are always be the shittiest place one can ever be visited. A coir doormat with a thick rubber nonskid backing. With this Mustache door mat at your door front will sure to make your guests smile as they enter your abode. A quality door mat to add classic style to your front door. This natural coir doormat will let the ladies know just how dignified and sophisticated you truly are. This Rude doormat is here to make a bold decision “be nice or leave”. A bold message you want to convey to your guests sometimes when they don’t behave the way they should. This doormat can be a bit rude sometimes but it will make sure to get a good laugh out of them. If you don’t like to have a touch of a technology “Door Bell” at your front door or if you like to hear your name by yelling really loud. This funny doormat will the one you need. It will ask your guests to yell loud “Ding Dong” in your front door and skip searching for a doorbell. Sure everybody is welcome – but those that come bearing wine are truly special friends indeed! With this funny doormat there will be two possibilities for sure; one you could get a free wine from your guests or friends. Second, your guest will sure to get a good laugh out when they see his front doormat. A funny doormat to direct thieves to your neighbours’ house or can say a chance to prevent your place from getting robbed. If they get the right direction that means you’ll be sending a hard party to your neighbour’s house. Handcrafted with a non-slip PVC backing and natural coir. A funny doormat for all those kids who always get in with the mud in their shoes. 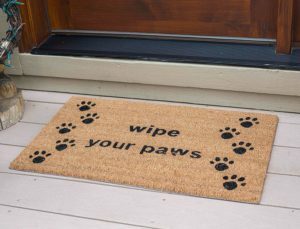 The funny and cute message on this doormat will remind them to wipe their shoes or can say paws before entering the house. So if your kids forget to wipe their paws before entering place this doormat to convey the message every time they enter. This would also work for your guests. 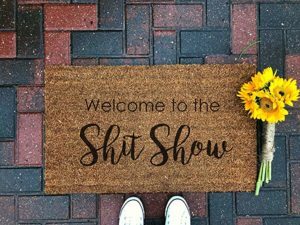 Give your houseguests a taste of your subversive sense of humor when they catch a glimpse of Entryways’ “Nice Underwear” doormat on your front door. This durable doormat will keep your guests laughing for years. People always get a giggle when they see this mat. This mat is hand stenciled with fade-resistant dyes. Crafted by all-natural coir with slip-resistant backing. Get rid of unwanted Police visits at your front door. If ever police came to your home and saw the words on your doormat that would be the funniest thing ever. 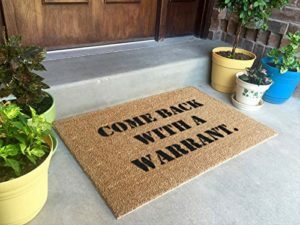 This funny doormat would pass off your words in a funny quote to that unwanted police “Come Back With a Warrant”. And remind them to follow the rules as you should.